CHARBHANGURA, Bangladesh — Each year the brown waters of the Gumani river swell during the summer monsoon, creeping over the surrounding fields to flood Charbhangura, a village of 2,500 people in the Pabna district of northwest Bangladesh. From July to October the waters can rise at least 10 feet. The trunks of trees more than 30 feet away from the dry season riverbed show watermarks waist high. When the fields flood, the village’s farmers have no work. But three years ago, Ms. Khatun was trained by Shidhulai Swanirvar Sangstha, a Bangladeshi nonprofit organization, to tend an unusual source of food and income: a floating farm with a duck coop, fish enclosures and vegetable garden moored by rope to the riverbank. This money goes a long way in rural Bangladesh, especially for villagers struggling to survive. Ms. Khatun, who has no education and bore the first of her two children when she was 15, previously earned nothing. Climate change threatens to worsen the severity and duration of floods in low-lying Bangladesh. 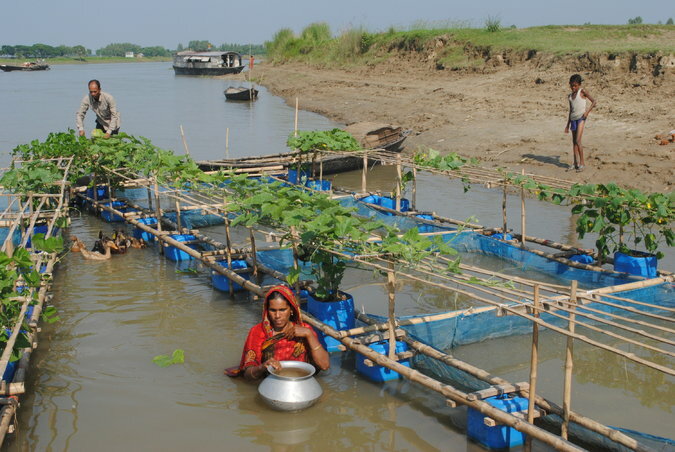 Floating farms — and produce that can flourish in flood conditions — are a way to help Bangladeshis live with rising waters. “There is big demand for solutions for climate change-affected areas,” said Mohammed Rezwan, the founder and executive director of Shidhulai. With the extra income from selling eggs, fish and vegetables, Ms. Khatun started saving money in a bank for the first time, bought a bed to keep her and her family off wet ground in their dirt-floored home, and helps her husband support the family. In northern Bangladesh, agricultural land is regularly flooded as rivers are engorged by the annual Himalayan snow melt and monsoon rains. In one of the world’s most densely populated countries, where 156 million people live in an area the size of Iowa, thousands are left with no way to earn a living. Many migrate to already overcrowded cities, contributing to urban blight. Mr. Rezwan founded Shidhulai as a 22-year-old architecture graduate in 1998. That year, disastrous flooding in Bangladesh killed 700 people and left 21 million homeless. Initially, Mr. Rezwan focused on building schools on boats, and worked to ensure that thousands of children would not fall behind when roads were blocked by floodwaters. To date, the nonprofit’s fleet, which now numbers 22 schools, five health clinics and 10 libraries, has provided continuity of education and other services for more than 70,000 children in villages isolated by seasonal floods. Four years ago it started to also build floating farms for villagers, and particularly the landless poor, to help them eke out a living during the months of floods. So far there are 40 floating farms that are worked by about 300 women: Mr. Rezwan has ambitious plans to create 400, to serve 3,000 women and their families in the next few years. He also argues that the floating farm concept could help other riverine developing countries, as has been the case with floating schools. “They have the potential to be replicated around the world,” he said. Shidhulai’s school boats have been copied in several other countries, including the Philippines, Cambodia, Vietnam, Nigeria and Zambia. A floating farm measures about 56 feet long and 16 feet wide. The coop can house 100 ducks and is equipped with a small solar panel to power lights inside. It floats on empty oil drums, plastic containers and a bamboo platform. The coop is attached to bamboo rods that make up two rows of fish enclosures where tilapia is farmed in blue plastic nets. The outer rails of bamboo support the garden. They hold old plastic jugs cut in half where villagers grow cucumbers, beans and gourds in soil and natural fertilizer. Mr. Rezwan took his initial concept for the farms from floating gardens that had been used in southern Bangladesh for hundreds of years. Those gardens layered water hyacinths — a type of weed — over bamboo structures and topped the resulting artificial island with soil to grow vegetables. The design had to be modified however, to suit local conditions. The southern model didn’t work in the north, where heavier rains waterlogged the vegetable beds and it was difficult to create drainage. Water hyacinth was also less plentiful in the north. The duck coop, originally built on a bamboo platform, now rests atop more-buoyant plastic oil drums — recycled and found materials are enthusiastically used alongside locally grown bamboo. Villagers can now build the entire structure for the equivalent of $260, which is covered by Shidhulai, Mr. Rezwan said.